Full of wisdom and light, Master Yoda crashes through your wall illuminating your room and banishing the Darkside. 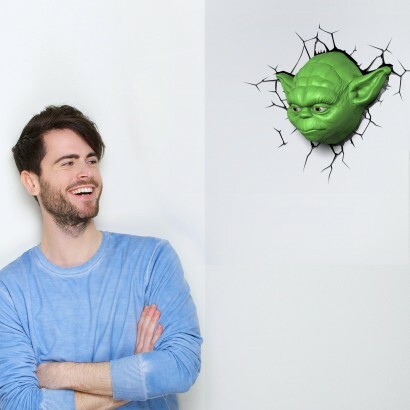 Lit by green LEDs, Yoda’s whole face lights up casting a gentle glow into your room soothing Younglings as a night light or as a mood light in your man cave. Battery operated and with no trailing wires, Yoda can be placed anywhere in your home, and with a timer function, can be set to automatically turn off after twenty minutes. 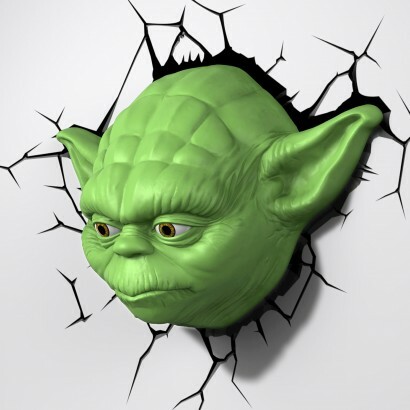 Place the crack backing sticker on your wall and then place Yoda over the top to create the incredible crash through effect, and it appears though Master Yoda has used the Force to crash through your wall and peer inside!